João Pereira da Cruz is an engineering graduate and a member of the Portuguese National Association of Engineers. He has been a partner and member of the board of J Pereira da Cruz SA since 1974 and an official industrial property agent since 1984. Mr Pereira da Cruz is a highly recommended and well-regarded expert and practitioner, with in-depth knowledge and vast expertise. Mr Pereira da Cruz has extensive national and international professional experience in a wide range of areas. 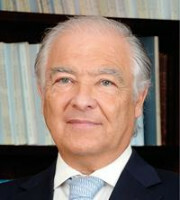 He holds several leadership positions in Portuguese and European IP organisations and currently serves as president of the Portuguese Association of Intellectual Property Consultants and secretary general of the Institute of Professional Representatives before the European Patent Office. He is also president of the Portuguese Association of European Patent Attorneys and past president of the European Communities Trademark Association and the Union of European Practitioners in Intellectual Property, In addition, Mr Pereira da Cruz is an active member of all of the main IP associations, including the International Association for the Protection of Intellectual Property, the Association of Trademark and Model Law Practitioners, the Chartered Institute of Patent Attorneys, the Chartered Institute of Trademark Attorneys, the International Federation of Intellectual Property Attorneys, the German Association for the Protection of Intellectual Property, the International Chamber of Commerce Portugal, the International Trademarks Association, MARQUES and the Pharmaceutical Trademark Group. These national and international appointments recognise Mr Pereira da Cruz’s commitment, competence and innovative capabilities, which make him one of the most authoritative voices in the IP field. Mr Pereira da Cruz is a regular speaker at worldwide conferences and events on a broad range of subjects, such as IP protection in Portugal, the EU trademark system and the unitary patent. He also regularly contributes to publications in the field.